Photo courtesy of Deer Mountain Inn. It’s the first official weekend of fall, and between now and Columbus Day the calendar is jam-packed with events. If you’re into street-fair-style festivals, two popular annual food-themed events are happening this weekend: the Hudson Valley Garlic Festival (Saturday and Sunday in Saugerties) and the Cauliflower Festival (Saturday in Margaretville). 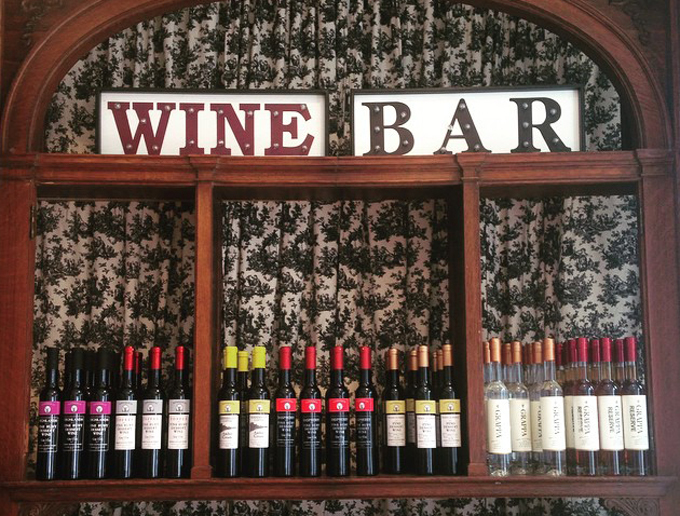 Here are our picks for fun places to eat and drink while enjoying the Catskills. Know of a food-related event coming up? We do this every Thursday, so let us know, too. Wine Dinner at Deer Mountain Inn: Friday, Sept. 25, 790 County Route 25, Tannersville. The lodge and restaurant has teamed up with its new neighbor, the Hudson-Chatham Winery’s Tannersville tasting room, which opened in July, to put on a five-course dinner with wine pairings. The one-year-old inn is set in woodsy seclusion just outside of the village — a lovely spot to take in the emerging fall foliage. Dinner is $80/person and reservations are required: 518-589-6268. Brewed in America Oktoberfest: Saturday, Sept. 26, 2 to 6 p.m., Andes Hotel, 110 Main St., Andes, (rain or shine). The Andes Hotel’s outdoor Summer Shack is always a good time, and this celebration of fall-themed domestic beers is no exception. For $30, you get a tasting glass and a chance to sample the wares of Brewery Ommegang, Butternuts Beer and Ale, Southern Tier Brewing Co. and many others. The Andes Barbecue Co. will be smoking and the Jack Grace Band will play. The Rondout Valley Growers Association Harvest Hoedown: Saturday, Sept. 26, 3 to 9 p.m., Tongore Park, Marbletown. This all-local-foods feast, sourced from area growers and prepared by local chefs, includes Vly Farm pork, Hudson Valley duck and barbecue chicken from Campanelli’s Poultry Farm. The event, which supports the RVGA’s farm-to-food-pantry and farm-to-school programs, includes fiddle and Cajun music, pumpkin painting, a zucchini race and lots of other family-friendly activities. Advance tickets are $25/adults and $5/children (six to 12 years old), available online. Tickets are $30/adults and $10/children at the door. Harvest Festival at Bethel Woods: Sunday, Sept. 27, 11 a.m. to 4 p.m., 200 Hurd Road, Bethel. The Bethel Woods Center for the Arts wraps up its 17th annual month-long celebration of Sullivan County farms, food and fun this week, with a special showcase of home goods. Catch the kid-friendly festival, which features a farmers’ market, live music, corn and hay mazes, pony rides and crafts. Free admission, $2 parking fee. No pets allowed. Meet the Catskill Center: Monday, Sept. 28, 5 to 8 p.m., Peekamoose Restaurant & Tap Room, 8373 Route 28, Big Indian. The staff of the environmental conservation group hosts a networking event fueled by nosh from Peekamoose’s local-food-based menu and excellent bar. Meet the new executive director, Jeff Senterman, and hear about the Catskill Center‘s upcoming projects and plans. Snacks provided; cash bar.